Since 2006 we’ve been providing language courses for learners around the world and we believe that Coffee Break provides the perfect solution for learners starting out with a language, or building their comprehension skills to take their learning further. Through Coffee Break French, German, Spanish, Italian and Chinese, you can build a solid understanding of the language and learn to use it in a wide variety of situations. However, one area we can’t help you with directly is with your speaking skills, and that’s why we’ve teamed up with italki, a leading provider of 1-on-1 language teachers and native speakers with whom you can practise what you’ve learned on Coffee Break. italki offers lessons and practise sessions from the comfort of your own home. You can connect with hundreds of teachers and native speakers of your chosen language and schedule a live 1 on 1 session to put into practice the language you’re learning in your Coffee Break course. Scheduling an italki lesson couldn’t be easier. Browse the italki profiles of professional teachers and tutors and select a teacher based on their experience and reviews from other learners. Many teachers and tutors offer a trial session so that you can decide if they’re a good match for you. Choose a time and date which suits you for your live lesson. Connect with your chosen teacher at the appointed time via Skype or other video chat software. Watch the video below for more information on italki. Why do we recommend italki? Learning a language is about both “receptive skills”, or “input”, where you learn to understand the written and the spoken language. The Coffee Break lessons will help you develop your understanding, your knowledge of grammar and the patterns of the language, and your ability to use the language yourself. It’s also about “productive skills”, or “output”, where you’re “producing” the language by talking and writing it. Through our lessons and particularly our bonus audio materials, we help you to train yourself on knowing the right word or phrase to use at the right time. The missing element is getting the all-important feedback on whether what you are saying is, in fact, right. That’s where a friendly native speaker or teacher comes in, and that’s why we’ve partnered with italki. We’ve also been able to put in place a special offer for Coffee Break learners: when you purchase your first live lesson with a teacher or native speaker on italki, you’ll receive a voucher for $10USD in italki credits. Please note that this offer is only available for new italki users. Coffee Break language courses provide you with the best language training on the planet, and italki connects you with the best teachers and native speakers to practise what you’ve learned! I am undergoing CBF masterclass January and I just came across with your italki post. After reading it, I’ve decided to give it a try and become a new user but I don’t really understand how I will receive the 10$ in italki credits. How should I proceed to get the 10$? 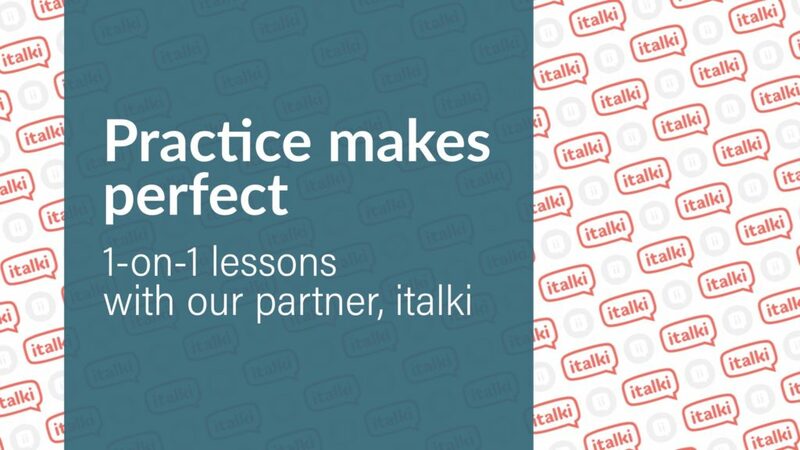 If you use our link to access italki, then when you sign up and purchase your first lesson, you’ll be credited with $10 of italki credits. I hope that helps. We’re delighted that you’re enjoying Coffee Break French!